October's focus for Troop 50 Scouts and leaders has been on backpacking, all leading up to the troop's October 18-19 excursion on the Pine Mountain Trail. The trail is comprised of 23 miles of footpaths that cross and follow the beautiful Pine Mountain ridge in west central Georgia, and is located inside the Franklin Delano Roosevelt State Park, near Callaway Gardens. Much of the land that the Pine Mountain Trail crosses once belonged to President Franklin D. Roosevelt. Since 1975, the Pine Mountain Trail Association and its volunteers have labored to build the best trail system possible. on proper use of a compass. Relying on the experience some of the troop's senior Scouts acquired during their summer 2013 expedition to Philmont, the October 6th troop meeting was devoted to increasing Scouts' familiarity with packing and cooking techniques. Until now, many of our Scouts had camped only feet from the troop trailer and prepared food on camp stoves using equipment from chuckboxes and food stored in coolers until needed. Scouts learned that they would have to pack in their patrol's food and cooking equipment, in addition to their own personal gear, and pack out those same supplies along with their trash. 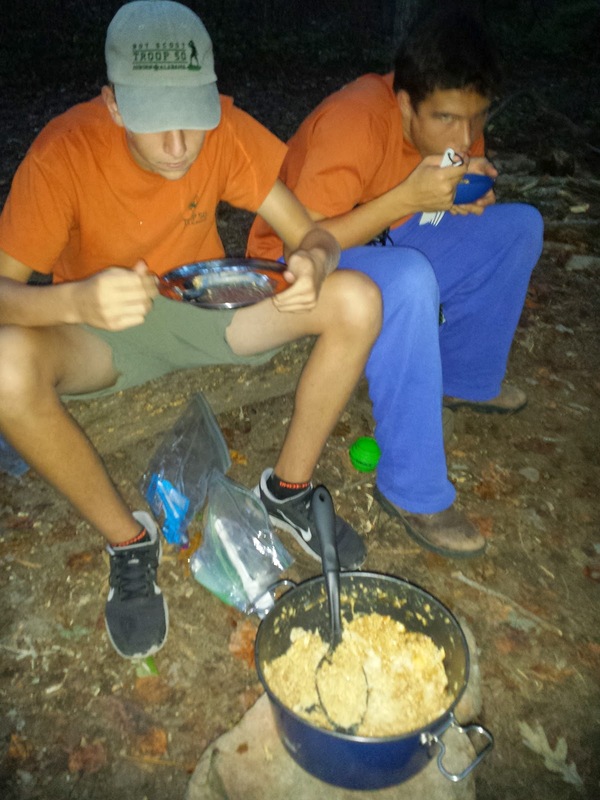 The expedition would also provide many of our senior Scouts the opportunity to do some backpacking cooking to complete requirements for the now-Eagle-required Cooking Merit Badge. At the October 13th troop meeting, our Philmont-hardened Scouts presented tips for navigating trail maps using a compass, and patrols met to organize menus and discuss the gear needed for the trip. scenic views of Odie Overlook. The troop set out early Saturday morning for FDR State Park. Upon arrival, patrols oriented themselves to the trail map and set out on the 6.7-mile Wolf Den Loop. The Buck Patrol set out first for the Bumblebee Ridge Campsite, led by Assistant Patrol Leader Josh, joined by SPL William and Quartermaster Andrew, and under the supervision of assistant scoutmasters JP Pendleton and Wes Williams. Soon after, the Turn Up Patrol departed for Old Sawmill Campsite, led by Patrol Leader John, joined by ASPL Davis, and under the supervision of Scoutmaster Andrew Baird and Chartered Organization Representative Michael Tullier. The shady canopy of the initial portion of the trail gave way to sunny ridges and warmer temperatures. Odie Overlook was the first opportunity to see the expansive ridge that bordered the Pine Mountain Trail. It was soon after that the two groups intersected for the first and only time as the Turn Up Patrol sought a spot for lunch around the same spot the Buck Patrol was finishing up its lunch stop. including a tree-hugging demonstration by SPL William. The Buck Patrol passed Old Sawmill Campsite on its way to Bumblebee Ridge Campsite—which was about another mile down the trail and part of the roughly seven miles the patrol covered on Saturday. Upon arrival, the patrol discussed logistics, with some traversing the quarter-mile downhill climb to filter water and others setting up tents. With one group focused on preparing the patrol's dinner of chicken and rice, other groups prepared a sump (to dispose of cooking and cleaning waste) and readied the patrol's bear bag (to help prevent animals from raiding remaining food stores and trash). Before hitting the sack around 8:45 p.m. central time, the patrol made one more run to filter water and then conducted a "Rose, Bud, Thorn" assessment that included enjoying working together as a team (the positive, or "rose"); hitting the trail in the morning, finishing up the trip, and getting home to good food like pizza (the opportunity, or "bud"); and dealing with the challenges of hiking inclines and dealing with backpack issues (the negative, or "thorn"). and their tasty chicken and rice dish. After logging just more than six miles for the day, the Turn Up Patrol's Old Sawmill Campsite featured a scenic stream and plenty of space for the patrol to stretch out. After settling in, the patrol encountered a significant challenge: a malfunctioning water filter that required the patrol to resort to boiling its drinking water. With hot water left in water bottles to cool, the patrol focused on preparing its dinner of rice, chicken, and gravy—along with a host of cookies, crackers and other sweet side items in each person's food bag. As cooler temperatures settled in, a nice fire kept everyone toasty until the patrol called it a night—by 8 p.m. central time, if you can believe that! After the Turn Up Patrol covered the distance to Bumblebee Ridge Campite and troop regrouped mid-morning Sunday, it traveled together to the nearest water source where the Turn Up Patrol had a chance to refill its water bottles. The group's next stop included the troop's opportunity for reverence, during which time Mr. Tullier led a devotion entitled "Carrying Your Burdens" using the backpacking trip as a theme and centered on Mark 12:30-31 and Galatians 6:2. Perhaps the fastest Scouts (and leaders) were witnessed traveling was from the sight of the trailhead sign to the cars in the parking lot! Upon reaching their cars, Scouts and leaders boasted a total of 8.6 miles during the two-day trip. For our newest Scouts, as well as many of our older ones, the trip represented the most trail miles ever covered on a troop backpacking trip. At its post-campout Patrol Leaders Council critique Monday evening, the PLC members offered positive comments on the scenic views, weather, food, and cooperation within the Buck Patrol. The PLC felt the troop could improve for the next trip by refining Scouts' packing techniques, which for a first backpacking trip were generally good; and to reinforce forgotten outdoor skills, including "Leave No Trace" principles. 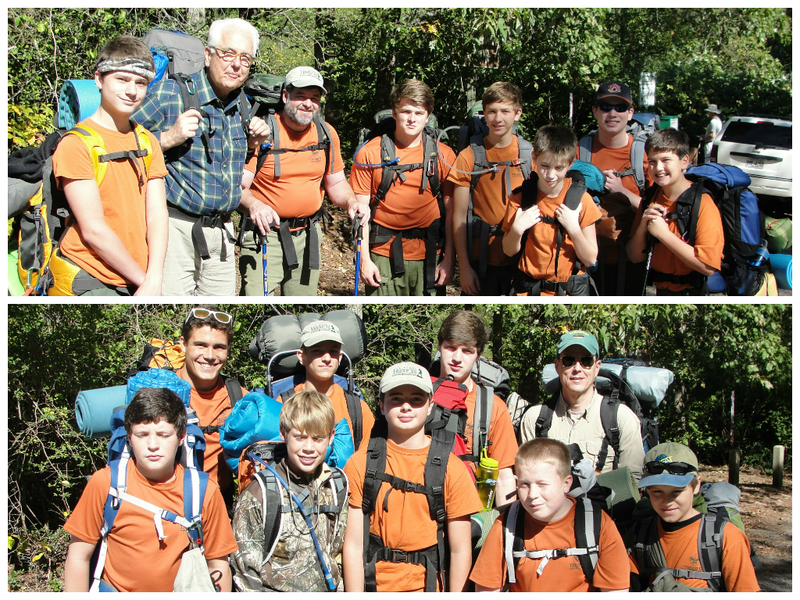 More photos from the trip are available in the troop's online photo album.